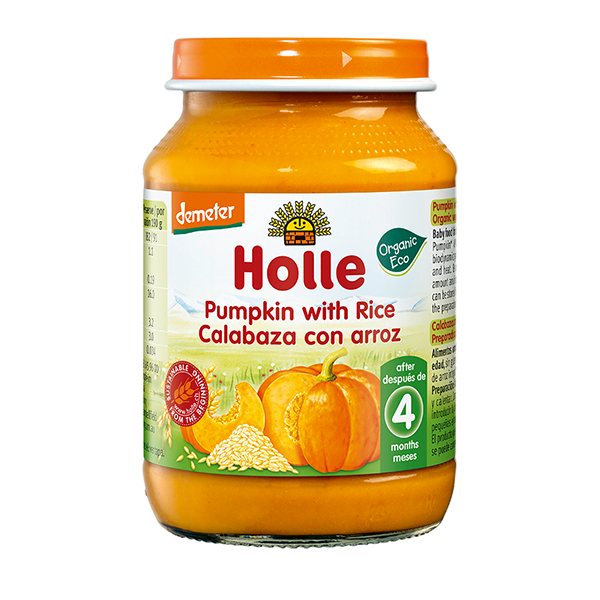 Holle Organic Pumpkin and Rice is an ideal combination of vegetable and a gluten free grain when weaning your baby. This jar is a welcome addition to a mixed diet during all stages of weaning and babies just love its taste. The Holle Organic Pumpkin and Rice is ideal if, as can sometimes happen, your baby has developed a tendency to constipation after introducing root vegetables like carrots - switching to pumpkin as a weaning vegetable for your baby is usually recommended. To increase the availability of essential fatty acids we recommend fortifying with 2 teaspoons Holle Organic Weanng Oil, stir and slowly heat in a water bath. Check feeding temperature. I had been trying to get hold of pumpkin for my little one to try but as it’s out of season I was struggling. I usually like to make my own baby purées but this was the next best thing so that I could introduce pumpkin. He really seems to like it and it kept him fuller for longer too. Yet another fantastic product by Holle. My now 1 year old has been on Holle products pretty much since birth. And nothing beats this brand. My baby has been eating and loving Pumpkin with Rice for a good few months now. Even now that she likes more lumpy food she never says no to Pumpkin and Rice. it has lovely consistency and really tasty. She eats it either warmed up or room temperature - which makes it very convinient on the go when you dont have access to warming facilities. Premium product and absolutely fantastic service by Ulula. I used as a pasta sauce with lentil pasta lovely and healthy ... quick to prepare and great for travel! Super quick and easy delivery, everything was very well packed. More importantly, my 5-months old loves the Pumpkin with Rice. It is very smooth and goes down well. She is increasing the amount she eats daily. I have already used Hole jars for my two older daughters. I find it difficult to source that quality veg where I live, especially if it is not carrot or potato, so I decided against cooking myself at this stage. I also found it impossible to find baby jars of that quality for this age range in the shops. I like that everything is packaged in glass and hasn't got many ingredients. I prefer to introduce new food/vegetables one by one and most baby jars in the shops are a mixture of loads of different ones in one jar.